Sometimes items in the newspaper are so outrageous that it’s hard to believe they are true, but often they are equally funny. 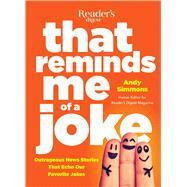 In the November 2012 issue of Reader’s Digest magazine, humor editor Andy Simmons wrote an article called “That Reminds Me of A Joke” in which he paired a brief, funny news story with a joke that was eerily familiar. The article was a hit with readers and since then it’s become a regular feature with the magazine’s humor sections. Whether it’s poking fun at typical relationship issues, or pointing out the inanity of local bureaucracy, That Reminds Me of a Joke will keep you laughing.